I was idly watching a TV programme on Egyptian art yesterday. An Egyptologist was interviewed, and commented on the way the Old Kingdom Egyptians were much more careful and realistic in their portrayal of the natural world than in human figures. This, she explained, reflected how they viewed the cosmos. Humans, she said, were just the beasts of burden for the gods. They were, in many ways, lowest in the scheme of things. Animals, by contrast, were in direct communication with deity – they spoke the secret languages of deity which humans could not understand, and so were sacred both in themselves, and in the wisdom they could impart through omens, and so on. That description shows what a revolutionary worldview the ancient Hebrew one was, especially given the story of Israel’s origins in Egypt. For their creation story, the first few chapters of Genesis, placed man at the pinnacle of creation under God, made not to be God’s mere slave, but his vice-regent on earth. Now I must quickly add that the whole biblical picture is one of stewardship on God’s behalf, of rule for the sake of the ruled, and not as the self-centred exploitation of absolute ownership which came to be understood in some quarters in early modern times (giving rise to the Baconian aspect of scientific endeavour as well as the excesses of industrialism). Indeed, it’s as much as anything a priestly role (made doubly clear in the Adam account of ch2, but inherent in the structure of Genesis 1 as a temple inauguration text too). It seems, according to Ted Davis’ recent BioLogos article, that Robert Boyle was one of the first modern scientists to see this priestly role partly in terms of understanding creation and offering worship to its Creator that the creation is incapable of articulating for itself. Note what a direct reveral of the Egyptian view that is – where it was the animals thast were the mediators between mankind and the gods. Nowadays, some evolutionists have taken on board a worldview that marginalises mankind. I’m not sure where it arose, and perhaps it doesn’t matter. But either they provocatively cite bacteria as the pinnacle of evolution on numerical and longevity grounds, or view humans as parasites threatening the whole world order. But a majority even of these, when push comes to shove, regard human beings as responsible for the custodianship of our planet. Where nature cannot help itself, we have the nous and the duty to step in and preserve it both for our own benefit, and for its own sake. What is interesting is how that attitude, even in secular circles, is a direct descendant of the revolutionary Hebrew worldview, rather than the more politically powerful Egyptian one. Indeed, it’s closer to the Bible even than to the Renaissance humanistic mantra that man is the centre of all things (isn’t it interesting how Renaissance artists, in contrast to Egyptians, did humans far better than animals?). I suggest that, especially for Christians, understanding that biblical creation wordview, in all its implications, is a corrective to many of the problems we see in the environment today. That takes some work because creation doctrine has suffered perversions both within the Church and outside it down the centuries. But it still makes more sense for our world than that of the Old Kingdom, or that of the New Atheism. What New Atheists and evolutionary biologists note is that both the Hebrew and Egyptin views are wrong: there is continuity between other animals and humans. We are literally distant cousins with all other life on earth. This is a dramatic revelation, one not reached by studying myths but by carefully looking at reality. The Hebrew myth misses the main point–there is an actual blood kinship, a continuity, between us and animals. Many Christians spent most of the last century ridiculing and denying this insight. It is quite a stretch from “created on the same day” to actual kinship. I don’t think a blood relationship is nearly as crucial as a common Creator. Even Linnaeus, a solid fixist, was aware of that – taxonomic relationship preceded any knowledge of common ancestry, and was no leass significant. Even in human relationships, a blood relative you’ve never met can be far less important than an adopted family you grew up with, or even shared experience or education. The myth of separate creation implies discontinuity, and breeds the kind of chauvinism shown by Sy’s article on Imago Dei. You know separate creation is a myth— why base anything on it? I never understood the charge of chauvinism. So what? What is the fear? What will happen? That we will butcher animals for food or cage them up for some research project without consent? I think you and I have had a talk about the consequences to ideas. Like religious ideas, secular ideas have their consequences as well. I remember listening to a talk show where the host would talk about his discussions with high school students over the question of whether they would save the lives of their beloved pet or a perfect stanger if both were drowning. To his shock, many prefered the the stranger. Or how about the ever beloved folks of PETA that compare the slaughter of humans to the slaughter of chickens as both being a holocaust. Ok, you don’t get to these sorts of ideas out of a vacuum. They come from a particular philosophy of life. One that is not too far than the idea that man is equal to animals due to us millions of years ago sharing an ancestor. It’s funny, because the vast majority of us couldn’t care less about a second cousin, yet somehow, we are supposed to feel some continuity from our cousins millions of years ago. I made a mistake. I meant to type that they preferred to save their dogs. That we will butcher animals for food or cage them up for some research project without consent? The most direct application would be from evolution itself, I suppose, Hanan – that our consanguinity is no impediment to a Malthusian struggle for existence between species, within species and even between siblings – after the manner of Ottoman Emperors who cleared the harem of potential rivals by strangulation. As you suggest, and I stated in OP, the facts are not a sufficient basis for a worldview – metaphysical commitments make the difference between chicken holocaustists and eugenic ethnic cleansers. The religious teaching of solidarity with the rest of creation because of a common Fatherhood of God goes back, of course, at least to St Francis – but in fact you find it in the tradition right back to Patristic times and, for all I know, in the Rabbinic tradition. Chauvinism is a human trait, but with regard to nature has its roots firmly in the Renaissance humanist tradition, whence it was exported into the churches. Evolution doesn’t imply man is equal to (or less than) the animals. First Sy in his post, and now Jon and you, are wrong to make that claim. The deep lesson that evolution does teach us is our continuity with other living things, a genuine kinship. Whether that makes you care more for animals, or less, is not the point. The point is that it is true, unlike either the Egyptian or Hebrew myths. Many people here spend a lot of time talking about the consequences of ideas. I suspect many of you think that the perceived consequences of an idea are more important than the truth or falsity of the idea. But to your point, yes, we are physically related 10 to the 14th power to a molusk. Fine. So what? As Dawkins would say, we are post-evolution. Culture drives us. The deep lesson of evolution outside of our physical bodies is lost, if one believes in a God that states “you are more than that.” That’s it. Hanan, I didn’t bring up consequences as an argument in favor of the truth of evolution. I don’t bring up consequences to bring up truth of religion/God either. But you brought up consequences. So did I.
Lou, any particular myth has value precisely to the extent that it is true. Your myth that science is the only light light shining in a lost world is a false and particularly dangerous myth even though it has some truths associated with it as regards our physical understandings of the world (hence its seductive nature). Other religious myths can also be variously dangerous and false, but true ones are particularly valuable even if some somemisunderstandings and falsehoods are accumulated in association with core truth. Myths might be very related to (if not nearly identical) to the concept of ‘Worldview’. So their truths are over-arching ones that are used as the lens you look through to evaluate the world around you. So it is no good trying to establish that some myth is true or false on the basis of modernist mechanics (physical science) since that is itself a myth that causes you to place over-riding priority (indeed to the exclusion of all else) on the mechanical aspects of the world. Other myths recognize and communicate Truth on their own terms without first kneeling in homage to some scientistic myth. But I do suppose metanarratives can be deeply nested, and science can be usefully embedded in its proper place as a useful tool for some of the higher myths that can (and have) incorporated it. “Lou, any particular myth has value precisely to the extent that it is true.” Exactly. We know the Hebrew and Egyptian myths are not true. Whatever truth you see in one or the other is brought from outside the myth itself. You cannot use your myth to argue with an Egyptian about the truth or falsity of his myth. “Your myth that science is the only light light shining in a lost world is a false and particularly dangerous myth.” In contrast to myths, a Hebrew and an Egyptian could indeed argue about the truth or falsity of a scientific claim (of kinship, for example) and hope to resolve the issue, at least provisionally. That is what is special about science as opposed to myths. If you have read and written poetry you may not make such glib statements about myth and truth(s). Whatever is discussed using human language and symbols needs to be understood first and then we may consider the content and historical context. Dismissing everything without understanding what it means is shallow by any standards – claiming that science justifies such outlooks is simply false. If you treated your sacred texts the same way that we treat poetry, you and I would not disagree so much. We could then freely sort out the good stuff from the garbage. Instead, religious people invest their sacred texts with a false authority, something we never do with poetry. Thus religious people are forced to find grains of truth even in passages that are nonsensical products of the myths and caprices of earlier cultures. You continue with your gross disrespect for sacred text – I have pointed out your problem with mythical statements, and how we human beings may discuss and understand each other’s outlook – most of this is non-scientific, and requires a deeper understanding of language and symbols. Sacred text is discussed openly and the reason why people believe its message is clearly stated. I have pointed out your odd position, in that you claim not to believe or regard such text as sacred, yet you have chosen to become, to an astonishing extent, a commentator, critic, anti-something, all apparently because you have science to give you your self-referential authority. In case you begin your ramble about Christianity, the Bible is sacred text because we believe people have been guided by the Holy Spirit in the writing, and we need such guidance in understanding it. This automatically states those who do not believe would not be expected to understand (before God even foolishness may be imbued with the Truth). So should I psychoanalyse you to try and understand your odd behaviour? I cannot see anything scientific about your remarks, so what should I do when reading your ramblings? Do you respect sacred texts other than your own? Do you respect the Mormon sacred text, for example? Those guys believe Joseph Smith was divinely inspired when translating his golden tablets into the sacred book of their religion. I guess only some sort of insight of your state of mind can do justice to your ramblings – e.g. from your endless disparaging remarks on other people’s beliefs, you now are in a position to question me! Man what is so weird about you, is your state of mind. Have you studied everything and now with other atheists, you are ready to condemn and force people to justify themselves to you? One should rather say, “That is what is special about *reality* as opposed to myths.” Reality (or some part of it) is the object of attention for each myth (including the Scientistic myth). While it is true that we all have the reality of creation around us in common, we do not hold our view of its place or our place within it in common, and there is nothing science can reveal about that except some of the physical details. Yes, I agree. What’s special about science is that it has public reality as a referee. In contrast, myths have no referees. You can make up whatever you like. People believe in myths like an afterlife or a purposeful cosmos because they want to believe them, not because they are true. Science (and the myth of Scientism) both have physically accessible parts of reality as their referee, as do all myths. The fact that myths, including Scientism, refer to things beyond accessible or measurable reality does not in itself evidence that those myths are true or false. Their veracity must rest on other grounds. Religious people are fond of saying that science has little to say about the truth of their religious beliefs. Yet your particular Christian myth makes many fact-claims about publicly-accessible reality, and these details could have been confirmed by science, thus justifying your belief in your myth (especially the part about the Bible containing revealed truth). Science could have confirmed the special creation described in Genesis, or the short age of the universe implied by Biblical genealogies. Noah’s flood could have been confirmed by science. The Egyptians could have provided an independent record of the Exodus and the parting of the Red Sea, which archaeologists and geologists could have uncovered. There could have been good eyewitness accounts of the miracles of Jesus. There could have been independent Roman records of the events of the Resurrection, such as the zombie march on Jerusalem. There could have been eyewitness accounts of the Ascension. There could have been scientific evidence for the effectiveness of intercessionary prayer. There could have been unequivocal evidence of purpose in the cosmos. The Bible could have contained any number of revelations or properties that would unequivocally confirm its status as revealed truth. These things fall squarely within the domain of science. Science does not provide evidence for any of them, but it could have. The lack of confirmation is not due to the restricted scope of science, but rather to the contingent fact that your myth doesn’t happen to be true. I’ll continue this at the bottom. What people decide to find important (proximity of biological relation), and in which direction (closely related = more important, or the opposite) seems to be a variable in our human affairs. It is interesting that Darwin was eager to show the inter-relatedness of all species as a means of short-circuiting the racism he saw springing from the idea that some human races were a different species. Perhaps if that idea could be put down, it would be another nail in the coffin for slavery. But now we see that humans are willing to find whatever justifications are at hand to exploit other humans, regardless of relation. We will never be educated out of our sins, and science remains as blind and useless as ever against the real roots of these metaphysical problems. Thanks for this article, Jon. I particularly liked your opening commentary on worldviews. Very insightful! I love that Egyptian painting Jon used. The birds are lovingly painted and all recognizable as present-day species. I have used that same painting in the past to disprove the goofy but very common American young-earth creationist view that there were only a few “kinds” of animals on the Ark (corresponding roughly to genera or families), which later underwent rapid evolution after they left the Ark. 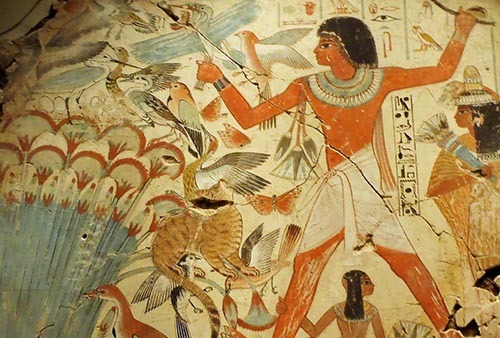 This painting shows that bird species haven’t changed at all in the region since around the time of the alleged Flood. Well, we can agree on that, at least. It’s just the people who’ve evolved to have two small eyes instread of one big one, legs not facing sideways etc! Old Kingdom art in particular has a kind of vigour that became more staid as the centuries passed, it seems. But then some of the most graphic representations of all are palaeolithic – our welsh pony looks identical to those you find in European cave art, down to the spots. We refrain from hunting him, though. We can agree on the power of paleolithic art, too. I used to be a wildlife painter (especially birds), and always admired the bold Picasso-like economy of paleolithic animal art. That is how in Brahmanism they explain the reason for the ritual. Sacrifices which are made by the gods or people restore the powers of the supreme initial deity and return to him the energy which it spent or alienated from itself thus restoring the initial Unity……. (as well as for Egyptian, Phoenician, Sumerian)….. The meaning of sacrifice is in protecting the cosmos and its variety when the forces of chaos threaten to destroy it. The revelation given to Moses expressly showed ….. the varied harmony of our world was blessed by the Creator; it was not a product of some insane act or cosmic war and not the product of sin. The Lord created the world as manifold and good and the fact that it is manifold is good too. This is what we come to think of as the segregation idea which can be traced through the Bible all the way to the New Testament. It is unhelpful to regard every worldview and belief system as the same; however understanding the various histories of peoples and traditions informs us and enables us to understand other cultures – atheists insistence that Darwinian views are right and all else is wrong is unhelpful. I note the Soviet Union made Darwinian evolution the only thing taught in schools, and ye we do not have generations of people in Russia clinging to Darwinian views with the almost fanatical zeal displayed by people such as Dawkins. This type of outlook makes so many assumptions that it is difficult to respond without indulging in humour. It is more the case that “some people have a desperate need to find confirmation I science, so much so they make science their servant”. Many historical events are recorded, and these records can be found today, mainly because rulers and generals have gone to great lengths to produce monuments to record their legacy. Many of these are exaggerations and their interpretation has been altered as more artefacts are found. It is unlikely that events that were not favourable to such rulers would have been recorded (unless false ones created – I recall some story about Egypt to be this, but I can be corrected). To insist that this criteria should be applied to Christianity is another example of desperation. From its conception Christianity was the domain of a few Jews, and Gentiles who would have taken steps to keep their faith secret from the authorities. Centuries after, when the Roman ruler decided to make it the State religion, many manuscripts and records were made and often effort made to preserve them. Now we have a self-declared apostle of science insisting that records that can be found must be part of a universal conspiracy, and when records cannot be found, constitute proof that everything is a lie. A desperate position to adopt by any standards of reason. Great, those will be really reliable evidence for the miraculous claims you base your beliefs on. I just have to ask (otherwise I will become really annoyed); has anyone forced you into a corner and threw evidence to convince you of a/many miracles. You sound as if you have fended of countless chaps trying to force something on you. I suspect that no-one would bother you Lou – just why do you act as an evangelical/proselyting atheist with some inane mission? Are you trying to save us, yourself, the world, from reports dealing with miraculous events that may have helped some people? What the heck is your problem? And for the nth time, at least try to pretend you are intelligent enough to read what is before you – miracles per se are not the basis for Christian faith. Try and deal with it. Belief in the miracle of the resurrection is the main basis for treating the sayings of Jesus as authoritative, rather than as points for rational discussion and potential disagreement. Faith from God, as an act of Grace, that Christ is the Son of God who has died for our sins, is the basis, to use your odd statement, for Christianity. You claim some understanding of Christianity (and at times all religions) and yet you do not understand this? What does that say about you? By the way, why is it that you insist we respond to your questions and statements, and yet you always avoid, obfuscate, and generally run away from any questions that are aimed at your motivation and basis for your own actions? I figure answering those questions once or twice is enough. In fact you have not given anything like an adequate answer, but then that is you – and the endless posts repeating the same drivel bout science and how everything that enters your head on other people’s faith, these repetitions are what? Your answer or questions to what? Lou, we’re agreed that things like the global flood, the age of the universe, and all of the many understandings about the physical world that historical and contemporary people draw from sacred literature are indeed within the scope of science. So science can indeed help sort out true and false understandings on those matters. How God does or does not act in the physical world either through ongoing providence or through special singular actions particular to a historical event –granted that those are part of the physical world that science can see, it is still beyond its scope to rule either way on God’s involvement in any of it, much less on the harder questions of meaning, purpose, and ethics. We’ve been over this many times before, so let me continue to illustrate to you with this challenge: What scientific test can you perform or even imagine performing to rule with certainty whether or not God designed us each specifically and had us all in mind from the beginning of creation? The fact that you will have exactly zero to offer in response to this challenge except the admission of defeat implied by shifting the worrisome burden of evidence away from yourself should illustrate how vacuous this Scientistic claim is. And the further retreat of trying to call any such claims meaningless or irrelevant is, of course, just yet another way of admitting that science cannot adjudicate on everything. Proponents of the Scientistic myth have to resort to these kinds of definitional tricks when they realize their worldview has no science whatsoever behind it. First, the view of science you express here is wrong. Certainty is something only religious people can enjoy. Second, note that you’ve shifted away from the Christian god that was the subject of my comment, probably because you know how indefensible your Christian belief is. I am going to continue to discuss only Christianity in this comment. In my comment above I had given you a long list of reasonable empirical predictions based on the idea that the Christian holy book really is inspired by a god. Many Christians thought most of these predictions were true, until science disproved them. (Some still think they are true.) Once they were disproven, sophisticated Christians identified those as allegories. But if any of those things had been true, science would have provided powerful evidence that the book really was inspired, or that there really was a god that had created man for some purpose. What evidence available today could convince scientists that there was a Christian god? Effective intercessionary prayer comes to mind. If prayers were answered more often than chance allowed, this would be a very powerful argument for the existence of a caring Christian god. Of course, absence of effect doesn’t disprove his existence, and you will always make up excuses for why evidence is absent in any conceivable test of this kind. But it is at least conceivable that science could have uncovered evidence for your faith. The fact that no such evidence has turned up, even where it would be expected, weighs heavily against the existence of such a god. I’m glad you’ve established that the statistically predictable vending machine god doesn’t exist. If I meet any devotees of the spvmg, I’ll be sure to refer them to the same information. Nearly every Christian I know believes in the efficacy of prayer, or acts as if he does. As the discussion seems to be becoming rather circular, vituperative and off-topic, I’m closing comments on this post. We don’t want to become another division of the culture war.